Home > Overview > What is Gluten Found In? Gluten allergies affect a large number of people in the UK. Sufferers have an intolerance to the protein gluten. The illness is often called coeliac or celiac disease and can have some very serious effects. The symptoms and effects differ considerably from person to person from very minor symptoms to quite severe effects. Gluten is found in wheat, rye and barley. It has a sticky consistency and for this reason products containing gluten are used in baking. The gluten helps the dough to stick together and makes the baked good chewy. Most flours have gluten in them. Most of us consume gluten every day without even realising it. 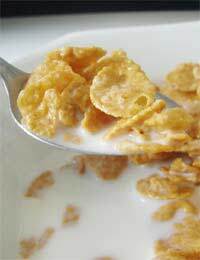 Many cereals, which most of us have for breakfast, contain gluten. Bread is also a product which contains gluten. Gluten should always be listed on the ingredients list on products bought in stores. If you are unsure at all you should call the product manufacturer. When eating out in restaurants if you have an allergy you should always speak with the waiter to find out if there is any gluten in the products on the menu. The waiter will be able to find this out by speaking to the chef. Some effects of gluten intolerance are quite minor. The sufferer may feel queasy or bloated. They may also suffer from headaches and diarrhoea or constipation. Obviously people with this allergy may not automatically know what it is they have. These symptoms can all be attributed to other illness including fevers and flu so the sufferer may not immediately assume gluten in the problem. The major symptoms of a gluten allergy are more severe. The sufferer may experience feelings of depression. He or she may feel down and tearful with little explanation. They may also suffer from dramatic weight loss. If they are not absorbing nutrients correctly, a common side effect of gluten allergies, they could become anaemic leading to extreme tiredness and nausea. Children with the disease can suffer from stunted growth. If the disease is undetected they may not thrive well and this can cause unlimited problems. Both children and adults could suffer from attention disorders and learning difficulties. There are also more serious effects caused by gluten allergies. If the allergy is not diagnosed early the sufferer could be at more risk of contracting bowel cancer than a person without a gluten allergy. The risk of infertility and miscarriage is also higher in those with gluten allergies than in those without. If you are diagnosed with a gluten allergy you should do as much research as possible to find out how to cope with your new lifestyle. With the right knowledge you should be able to continue living the life you’re used to. It is only your diet that must change. In some cases a small amount of gluten in the diet should be ok, depending on how you feel. Speak to your doctor about this but a lot of it will be down to how you feel.